Hopi House, Grand Canyon National Park, 1985. Hopi House, Hermit's Rest, Lookout Studio, and Desert View are all structures built on the precipice of the south rim of the Grand Canyon. The buildings, all designed by architect and interior designer Mary Elizabeth Jane Colter, were constructed by the Atchison, Topeka and Santa Fe Railway and managed by its concessioner, the Fred Harvey Company. Hopi House (1905) is a large multi-story structure of stone masonry, shaped and built like a Hopi pueblo building. The building is rectangular in plan, and the multiple roofs are stepped at various levels giving the building the impression of pueblo architecture. The sandstone walls are reddish in color. Tiny windows, like those of true Hopi structures, allow only the smallest amount of light into the building. On the interior, the floor finish on the first story is concrete, covered with carpeting in some of the rooms. Most of the rooms have the typical ceiling of that type of architecture: saplings, grasses, and twigs with a mud coating on top, resting on peeled log beams. Corner fireplaces, small niches in the walls, and a mud-plaster wall finish, typical of Hopi interiors, are also characteristics of this structure. Openings from one room to the next are characteristically small, and wood door frames where they exist are made of peeled saplings. The first floor is used as a sales area and an office. The stairwell to the second story has Hopi murals on its mud plaster. The mural's artist is unknown. The second story, now used only for storage, has a wood floor, ceilings similar to those throughout the building, and mud-plastered walls. The original room configurations remain, and little has been done to change this area that is now closed to the public. One corner fireplace on this story is decorated with a "bulto" (Spanish religious statue) attached to its mantle. Paired gates separating two of the rooms are made of peeled saplings. Also on this floor is a room now erroneously called "the Kiva" which contains a Hopi shrine somewhat similar to the Powamu shrine Colter had constructed inside her Indian Building in Albuquerque. The shrine area holds religious artifacts such as kachinas and prayer feathers (ceremonial sticks with feathers attached) with bald eagle feathers. The opposite side of the shrine room contains more Hopi religious artifacts and some household and utilitarian items such as manos and metates for grinding corn, various pieces of pottery and baskets, and a piki oven for baking the paper-thin piki bread made from blue corn. The floor in this room is hard-packed adobe rather than wood. Access to this room is through a tiny handmade door, now locked for security. The third floor contains am apartment where the manager of Hopi House lives. Although most of the apartment has been modernized for convenience, many original features remain. The apartment contains two bedrooms, a bath, a living room/dining room combination, a kitchen, and an entrance hall. Walls are finished with lime plaster, painted white, as are the ceilings. Included in this landmark nomination are all of the historic furnishings and ceremonial objects. Colter, an avid collector of antiques for the Fred Harvey/Santa Fe, used them in her structures as important props to contribute to the nostalgic moods she wanted to create. The life-size mudhead, the Spanish-Colonial benches, the bultos, and Indian artifacts are among the objects included. A sprinkler system has been installed in the structure. Most new electrical work has been added in exposed conduits so that the historic fabric remains untouched. Other changes to the building have been minor alterations to cosmetic finishes on the first floor, such as carpeting in the office. Hermit's Rest (1914), several miles to west of Hopi House, is an entirely different type of structure. The building, originally constructed as a rest stop for the short stage line that ran from El Tovar to this location, is now a gift shop and small refreshment stand. The stone structure is several feet back from the rim edge, protected at this point by a stone wall and metal railing. The structure is tucked into a small man-made earthen mound, built around and on top of the building to blend the structure in with its setting. The approach to the structure is marked by a small stone arch set in a stone wall along the original pathway from the parking area to the building. The stone arch is topped with a broken bell that Colter acquired from a Spanish mission in New Mexico. In recent years vandalism to the stone arch and bell necessitated moving the access path a few feet north, so that visitors no longer walk under the arch (and are tempted to try dunk shots through the hole in the bell). Stone lanterns with small pathway lights illuminate the area after dark. The exposed portions of the building that are not banked into the earth are of rubble masonry bonded with cement mortar, structural logs, and a few expanses of glass. The parapet of the flat roof is uneven, giving the building a rougher appearance. The chimneys are gently battered rubble masonry. The overall appearance of the stonework makes it look almost like a natural rock formation. The porch that shelters the entrance and covers a small portion of the gift shop is made of peeled log posts, tie-beams, and vigas (roof beams). A low stone wall of rubble masonry separates this outdoor observation area from the drop-off into the canyon. The interior of the building is divided into two large spaces and several utility areas. The main room and most impressive space is in the central part of the structure. On its north side the central room is covered by the flat roof of the porch. Further into the interior the roof height opens up dramatically to nearly two stories, and is again flat with a viga and latia ceiling. The upper wall sections in this area have large windows, letting considerable natural light into the structure. On the south end of the room is an enormous alcove, shaped like a semi-dome. The stone alcove contains an arched fireplace decorated with ornate andirons, a brass tea kettle, and various antique kitchen and fireplace tools. Wrought-iron wall sconces holding candles flank the far edges of the alcove. The alcove's flagstone floor is stepped up above that of the remainder of the room, giving added architectural emphasis to the space. West of the main room is the snack bar area, office, and small storage area. These have all been updated to accommodate the present uses, although their original configuration remains. East of the main room is the area now used as the "rug room" where Navajo rugs are sold. The original stone fireplace remains in this area. A wood wainscotting has been added, covering the original finish. A small storage area is to the east of this room. Hermit's Rest, like many of the other Colter buildings, contains antiques important to the structure s ambience. The furnishings included in this nomination are the rustic chairs, the chairs and tables that may be of German origin, the European pendulum clock, the bear traps, frontier items decorating the exterior post, and the other elements Colter added to create atmosphere. Back along the canyon rim in the vicinity of Bright Angel Lodge is the Lookout Studio (1914)--a small structure where Colter allowed the surrounding landscape to guide her design. The native stone structure, originally known as "the Lookout," is built into the canyon rim and, in a sense, looks as if it grows out of it. The small structure is generally rectangular in plan and constructed of coursed rubble masonry. The uneven parapet of part of the roof steps up to incorporate the chimney and a small observation room within its lines. The observation room has a small balcony with a jigsawn-patterned railing. Low stone walls lead up to the building, protecting visitors from drop offs into the canyon. Although constructed for viewing the canyon the building now houses a rock and mineral shop. The interior of the structure is divided into several levels. Structural logwork is exposed on the interior (posts, beams, and ceiling joists) and a small stone fireplace provides the simpler atmosphere Colter achieved here. The floor is scored concrete. Interior walls are exposed stone. Because of all of the viewing windows around the walls of the structure, the interior is considerably lighter than most other Colter buildings. A small stairway with log newel posts and railings leads up into the small enclosed observation tower and down from the building's main level to an exit that opens to an exterior observation area. The original ceiling treatment, probably latias (saplings), has been covered over although the vigas remain exposed. The ceiling finish is now sheetrock or a similar material. Fluorescent lights, another alteration to the building, provide additional lighting on the interior. The building has undergone little alteration, other than those changes listed above. The Indian Watchtower at Desert View (1932), the last of this series of Colter buildings, is at the eastern end of the south rim of the Grand Canyon. From a distance the building's silhouette looks like the Anasazi watchtower it was meant to mimic. In actual size the tower is considerably larger than any known Anasazi tower. In plan the structure is composed of one enormous circle at the north, a small circle at the south, an gently arced forms connecting the two. The largest circle and the arced portions are the sections of that building that are just one story in height. The smaller circular plan is for the tower itself, more than five stories high. The building sits out on a promontory overlooking the Grand Canyon. The most noteworthy aspect of the exterior is the stonework--a variety of uncoursed rubble below and coursed sandstone above, with decorative patterns of triangular stones adding architectural interest directly below the tower's parapet and other bands of color masonry adding even more visual interest. Her use of texture in the masonry creates a visual depth. Large walls sections of the tower, for instance, have a relatively smooth finish that in places is broken up by slightly larger stones protruding from the wall surface. Fenestration in the tower is irregular--tiny windows or those with irregular shapes--with the exception of the observation area at the top of the structure where large trapezoids of plate glass allow the viewer to see the surrounding countryside in all directions. Colter's careful massing of forms added more architectural emphasis to the tower. The main entrance into the structure leads into the largest room of the building, originally known as the kiva room, that is circular in plan. The ceiling is made up of logs salvaged from the old Grand View Hotel on Horseshoe Mesa at the Canyon. The logs are laid in a pattern found in prehistoric native American architecture and still used in some Indian structures today. A ladder from the center of the room leads up to an opening in the ceiling that looks functional but is actually false. A low, arched fireplace on one edge of the room has a small mantle and am enormous picture window directly above it where the chimney normally would be--the flue actually draws the smoke from an upper corner. The floor of this room is flagstone, and walls are stone. This room has undergone little change since construction. Directly above this room on the roof of this part of the structure is an outdoor observation deck. Other spaces on the first floor are used for sales areas, as this is, and a small amount of storage space. The kiva room contains heavy, rustic furnishings of large chunks of wood and rawhide, also included in this nomination. The most architecturally impressive section of the building is undoubtedly the tower interior. The space is an open shaft surrounded by circular balconies edging the walls and small staircases that lead up to subsequent levels. Only the uppermost observation area has a complete floor area covering the circular plan, and large plate-glass windows overlooking the surrounding expanses of the vast southwest. The rooftop observation area, reached by a ladder of sturdy log construction, is closed to the public. The steel and concrete structure of this space is entirely plastered and all of the walls are covered with murals. The most distinct images, painted by Hopi artist Fred Kabotie depict various aspects of Hopi mythology and religious ceremonies. The other murals done by Fred Greer are more subtle in color and purposefully softer in detail, and are copies of prehistoric pictographs and petroglyphs. The tiny windows of the tower let in a minimal amount of light which adds to the cave- like, mystical atmosphere of the space. Experiencing the multiple levels and circular balconies and the hundreds of prehistoric images inundates the viewer with an overwhelming sense of the southwest. Also included in this nomination are the two small outbuildings immediately adjacent to the Watchtower--the wood storage structure and the storage building. Both have stone veneers set in patterns similar to those of the Watchtower. Only the exteriors of those structures are included. The building has changed very little since construction. Some of the small exterior staircases have been closed to the public. "Coyote" fences--vertical saplings held in place by wire woven around them--close off those areas. Radio telemetry has been added to the roof. For the most part the building retains its integrity and image Colter wanted to create. Hopi House, Hermit's Rest, the Lookout Studio and the Desert View Watchtower are not only the best and least altered, but some of the only remaining examples of the work of master architect and interior designer Mary Elizabeth Jane Colter. Colter's place in American architecture is important because of the concern for archeology and a sense of history conveyed by her buildings, and the feelings she created in those spaces. More importantly, her creative free-form buildings, Hermit's Rest and Lookout Studio, took direct inspiration from the landscape and served as part of the basis of the developing architectural aesthetic for appropriate development in areas that became national parks. The buildings are also significant as part of the Atchison, Topeka, & Santa Fe Railway and Fred Harvey Company development on the south rim of the Grand Canyon--their most important destination resort. Desert View has additional regional significance in its tower paintings of Indian design--they were copied from prehistoric pictographs and petroglyphs at a New Mexico archeological site that is now destroyed. These may be the only surviving record of that rock art. During the 1870s the Atchison, Topeka, and Santa Fe Railroad (later the Railway) worked out an agreement with the Fred Harvey Company that allowed the latter to manage station hotels and restaurants that the railroad built. The Santa Fe hoped to lure passenger traffic away from competing railroads by providing these amenities along their line. In short, the strategy worked. By the turn of the century the restaurants known as "Harvey Houses" and the hotels along the expanding Santa Fe route became known for fine food, comfort, and extremely efficient service. The Fred Harvey Company also quickly noted the passengers' fascination with the Indians and the wares they sold at the railroad stops in the southwest and saw the situation as another merchandising opportunity. Their next logical step was to provide specific areas to sell the native american arts and crafts at some of their selected stops. Both the railroad and the Fred Harvey knew that through distinctive architecture they could create an image and ambience that would sell their merchandise better than a simple envelope of a building would. To add that distinction they hired architect and designer Mary Elizabeth Jane Colter. Mary Jane Colter was born in Pittsburgh in 1869 and grew up in Texas, Colorado, and St. Paul, Minnesota. While attending the California School of Design in San Francisco she apprenticed at an architect's office and then went into teaching back in St. Paul. Besides teaching on the high school level, she also lectured on history and architecture in a university extension program, reviewed books for the St. Paul newspaper, and took courses in archeology. Through informal contacts with the Fred Harvey Company, Colter eventually landed a job as interior designer of the Indian Building adjacent to the Santa Fe's new Alvarado Hotel in Albuquerque, along the main line. Although the Mission Revival style had been popular in California since the 1890s, the Alvarado Hotel and its adjacent Indian Building (both destroyed) were, according to the Fred Harvey literature, the first of their kind in New Mexico. Besides working adeptly on the displays for the Indian wares Colter also created a special ambience on the interior of the Indian Building. The small fireplace had comfortable seats around it an always had a fire burning. Colter arranged for anthropologist Henry Voth to construct a replica of a Powamu altar, or Hopi religious altar to show the visitors another side of the mystical and exotic southwest. The building also featured Navajo weavers and silversmiths who plied their trades for the enjoyment of the railroad passengers. This use of "living history" types of exhibits was later adopted by other railroad, particularly the Great Northern at Glacier National Park. Colter's second contact with Fred Harvey and the Santa Fe was to design an Indian Building across from the Santa Fe's new hotel at the Grand Canyon--El Tovar. The interior of the Indian Building in Albuquerque had been so successful that Colter was given even greater responsibility in this structure: she was allowed to design the whole building as well as the interiors. She designed the structure to be a replica of a section of a Hopi pueblo at Oraibi, Arizona. The materials and configuration were identical to those of a pueblo structure. Instead of bringing the tourists out to the pueblo, she brought a sense of the pueblo to the tourists. She even included some elements that tourists would be forbidden from viewing in a pueblo: a sacred sand painting and another ceremonial altar. In Hopi House, Colter's concern for an ethnohistorical correctness in this replication was an effort fueled by the contemporary scholarly interest in southwestern archeology. The building opened in 1905, at the same time that archeologist Edgar Hewitt of Santa Fe, New Mexico, was promoting the Act for the Preservation of American Antiquities which passed in 1906--an act that resulted in the establishment of a series of national monuments set aside to preserve the southwestern archeological ruins they contained. Colter's design of Hopi House went beyond the basic task of providing a good atmosphere for merchandising Indian goods. She introduced different aspects of Indian cultures--especially their architecture--to the rail-travelling public at a time when the preservation movement in the United States was in its infancy. Colter's next building for Fred Harvey and the Santa Fe at the south rim was Hermit's s Rest which was a very different sort of structure that Hopi House. Fred Harvey ran tours west along the rim to the end of the road at an old trailhead, and the company wanted a small refreshment stand where the passengers could recuperate after the dusty stage ride. Like all of the other Fred Harvey buildings, the company wanted something with character and style. The building's design was unusual. Tucked away in a small, partially man-made hill a few feet from the rim of the canyon the native rock structure seemed to grow out of the landscape. Colter channelled her concern for historicity into a few well- chosen items--an old New Mexican mission bell at the entrance gate, wrought-iron sconces and andirons, roughly crafted rustic furnishings, and a few heavy pieces of heavy furnishings of probably northern European origin. The rugged stonework was given a medieval feeling by the forms it took: arched stone fireplaces with a huge semi-domed alcove sheltering one of them. The peeled logs making up part of the structural system and the exposed latias for a portion of the ceiling contributed to a primitive, frontier feeling in the building. When the building opened in 1914 and Colter was cajoled by some of the railroad men that the structure looked too dingy and full of cobwebs, she replied, "You can't imagine what it cost to make it look this old." Colter's other design for the south rim that year was Lookout Studio--a building where visitors could photograph the canyon from its very precipitous edge and use the telescopes the company provided. In this structure Colter removed herself even further from her intent at Hopi House. Here, she allowed the edge of the canyon and the natural rock outcroppings give form to her multi level structure that grew out of the edge of the rim. Inspired by the natural forms of the landscape around the site, the parapet rooflines and stone chimneys mimicked the irregular shapes of surrounding bedrock. The roof even had small native shrubs growing out of it to contribute to that illusion of nature. Colter designed many more structures for the Fred Harvey Company and the Santa Fe Railway at the south rim and along the whole Santa Fe route, but her last major structure at Grand Canyon was the Indian Watchtower at Desert View (also known as Desert View Watchtower) on the eastern end of the south rim, completed in 1932. At Desert View Colter returned to a sense of archeology and ethnohistory in her design--reminiscent of an Anasazi tower such as that found at Hovenweep National Monument--but endowed the building with more of a mystical fantasy than the archeological correctness she used at Hopi House. Colter visited a number of Anasazi sites throughout the southwest that had towers and spent approximately six months studying them. She studied their shapes, stone masonry, and construction techniques. She then built a model of the site on the south rim and constructed a clay model of the building. When it came time to build the structure, after the Santa Fe engineers beefed up the structural system to their satisfaction, she was frequently on the job giving directions to the workmen. She hired two artists to do murals in the tower. The symbolic paintings on the inside of the Hopi Room by Fred Kabotie, a now deceased Hopi artist, traced some of the religious mythology of the Hopi people. Other paintings by artist Fred Greer were copies of rock art from now destroyed archeological sites at Abo, New Mexico. These may be the only existing record of that rock art. Colter's extreme care in the selection of the artists, their subject matter, and even the colors they used was identical to the care she used in selecting the site, designing the structure, and choosing the stones for the exterior masonry. Other buildings Colter designed for the Fred Harvey Company and Santa Fe Railway include Phantom Ranch (1922) at the bottom of the Grand Canyon; Bright Angel Lodge (1935), and the men's and women's dormitories (1936 and 1937 respectively) on the south rim; El Navajo at Gallup (1923); and La Posada at Winslow (1930). She also worked on interior for El Tovar, and La Fonda at Santa Fe. Colter's impact on American architecture, particularly on parkarchitecture, was noteworthy. Although the tourist favorites remain the charming Hopi House and Desert View Watchtower, their historical bent was secondary to the impact that Hermit's Rest and Lookout Studio created. In those two structures where she let the natural landscape shape the buildings, rather than the cultural landscape, she became a pioneer in the aesthetics of an architecture appropriate to a natural setting. Her use of natural materials in forms that mimicked nature served as the basis for later work by architect Herbert Maier and others who designed what we now term "rustic" architecture. Grattan, Virginia. Mary Colter: Builder Upon the Red Earth. Flagstaff: Northland Press, 1980. 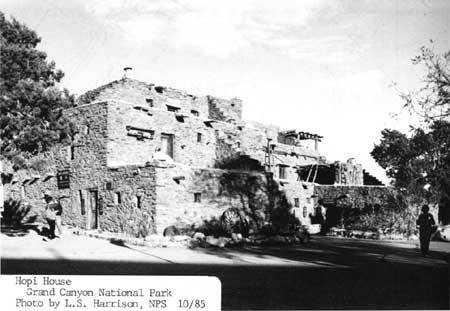 National Park Service files including National Register files and history files, Western Regional Office and Grand Canyon National Park. Hopi House. The boundary is a rectangle measuring 100 feet by 150 feet, centered on the building. Hermit's Rest. The boundary, as shown on the enclosed sketch map, begins at a point at the southwest edge of the parking lot and runs southwest 260 feet, the northwest 200 feet to the canyon rim, than along the rim to a point 250 feet from the building's northeast corner, then back along the curb edge to the starting point. Lookout Studio. The boundary is a square measuring 100 feet on each side, centered on the building. Desert View Watchtower. The boundary begins at the curb at the northwest corner of the parking lot, then proceeds northwest 90 feet to the Canyon rim, than follows the rim edge northeast and then southeast to a point 262.5 feet northeast of the north corner of Building 1168 (the store), then 45 feet southwest to the north edge of the service road, then following the service road west to a point 20 feet northwest of the north corner of the trading post, then southwest 115 feet to the curb of the parking lot, then along the curb in a westerly direction to the starting point.